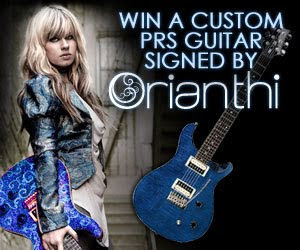 PRS Guitars Sweepstakes -- Win a PRS SE Custom 24 Signed by Orianthi! PRS Guitars will be giving away a PRS SE Custom 24 in Whale Blue (retail value: US$1023), signed by Orianthi. No purchase is necessary, but this one only applies to US Residents. To enter, visit www.facebook.com/orianthi, click the “ENTRY” button and fill out the entry form in accordance with the on-screen instructions. Entries must be received between December 3, 12:01 a.m. PT and January 14, 2009, 2010 11:59 p.m. PT. Really go crazy and let your imagination fly with a thematic graphic that best suits your personality. 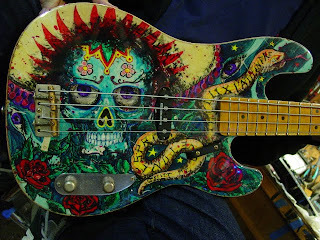 Check out this hand-painted bass that came through Gary Brawer's repair shop!